WHA worked with this global financial client to complete a restack, redesign multiple floors, and renovate the building lobby. 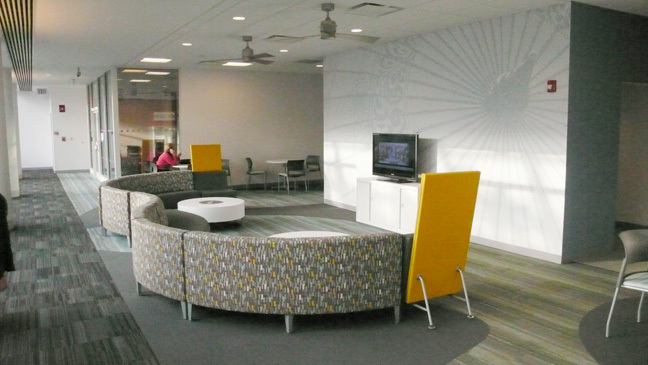 This corporate interiors project included everything from selecting new furniture, fixtures, ceilings and carpeting to installing wiring for wifi and video conferencing capabilities. This project incorporated two phases. Phase 1 included moving out of the client's existing three buildings and consolidating the team into two buildings, including their call center. It also consisted of reconfiguring, restacking and relocating multiple departments simultaneously. During phase 2, the two buildings were renovated and restacked through several construction phases. Multiple departments relocated to various floors per the client's new Global Standards, including desk sharing, benching, and reduced filing storage.